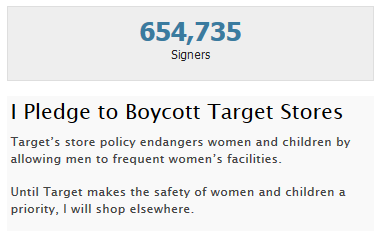 In response, over 650,000 people have now signed a petition up at the American Family Association pledging to boycott Target (654,735 at the time of writing this). The issue for most people is not transgendered people using the bathroom. The issue is criminals who pose as transgendered people in order to gain access to restroom and changing facilities they normally would not be allowed to go into in order to seek out potential victims. While the politically correct liberal left likes to pretend this never happens, they are simply wrong. As the AFA points out, there are numerous cases where this exact thing has happened. After the Ontario government passed a gender identity bill dubbed the “bathroom bill” in 2012, a 37-year-old man posing as a transgender using the name “Jessica” was able to gain access to women’s shelters where he sexually assaulted several women and peeped on them while in the shower. More recently, a 33-year-old man was charged in 2013 after he dressed as a woman in order to secretly videotape women in the restroom at a California Macy’s. The same thing happened back in 2010 when a 29-year-old man who did not attend Berkeley dressed up as a woman in order to get into the university’s locker room where he used his cell phone to take pictures of women changing. 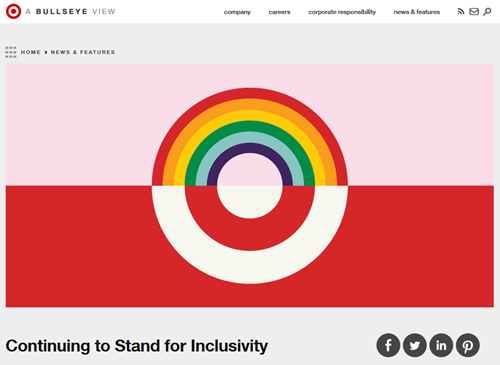 Target has also failed to clarify what qualifies for evidence of someone’s gender identity, seemingly leaving the door open for pretty much anyone to use any bathroom or changing room at any time in a Target store without question. It seems like a ridiculously obvious way to give predators access to victims in one of the most vulnerable places you can go in public: the bathroom. 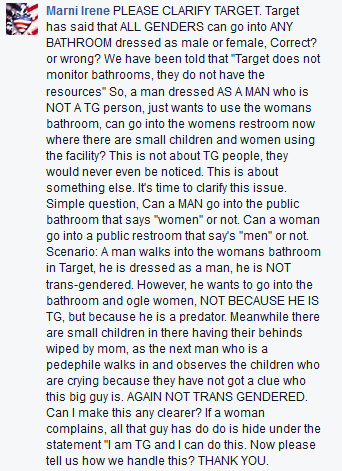 Many hundreds more left comments also saying they (and their families) were going to boycott Target, or at the very least, not allow their children or wives or sisters or mothers or grandmas or aunts or female friends to go to the bathrooms alone in the store anymore. 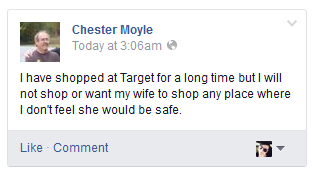 Even at 3 a.m., people are boycotting Target.